The latest film from Tom Tykwer re-pairs him with Tom Hanks, and ends up with some similar highs and lows as their last pairing in Cloud Atlas. By that I mean it features a lot of characters that don't always get their due, but the main storyline is worth seeing anyway. It doesn't quite play like the arthouse indie you might have been expecting, but that doesn't mean director Tom Tykwer doesn't add some artistic flair to the proceedings. In some ways I’m reminded of the premise of Rock the Kasbah, a comedy about a washed up man who lost more than he’d care to admit, but finds opportunity to turn it all around in a foreign country. However, the films go in very different directions after that, and Hologram for the King fares much better for it. 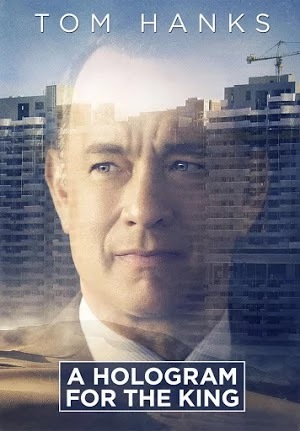 It’s based on the David Egger’s novel of the same name, and it tasks Alan Clay (Tom Hanks) with selling a new holographic technology to the King of Saudi Arabia. It’s a fish out of water tale in which the people he meets and the lessons he learns help solve his personal and familial issues. Yet Egger’s story (rewritten for the screen by Tykwer) is clever enough to never feel predictable, and Tykwer’s direction is full of artistic flourishes that keep the film from feeling generic. For instance, the film’s opening is a dreamlike sequence that walks Alan through a commercial set say-singing his sales pitch to the tune of “Once in a Lifetime” by the Talking Heads playing in the background. Except it isn’t a sales pitch, it’s his life he’s talking about, and it isn’t a commercial, it’s a dream. And when he wakes up, we’re given a quick shot to establish the culture clash Alan is about to find himself stuck in. Much the way Sofia Coppola setup Bill Murray being “Lost in Translation” with a short but humorous shot of the 6′ 2″ Murray surrounded by much shorter Japanese people in a cramped elevator, Tykwer surrounds Hanks with Saudi Arabians on a plane. The shot slowly zooms out as he wakes from his dream to hear a prayer being said all around him. He in the center of the screen dressed in his blue suit, the only one not dressed in white saying the prayer aloud. In just 3 minutes and with minimal dialogue, the character’s predicament is successfully established. Once he arrives, we’re given flashbacks to establish why he’s in Saudi Arabia. His company sent him to give a sales pitch for their new holographic IT tech support technology. It should play an integral part in building their new development dubbed “The King’s Metropolis of Economy and Trade.” However, once he arrives he finds his team stationed in a tent with no air conditioning, no wifi and no food. Worse yet, the King and Alan’s primary contact, Karim Al-Ahmad (Khalid Laith), are never available to meet. And of course, the delays have Alan’s bosses on his back. But that’s nothing compared to Alan’s familial troubles and the very literal lump on his back. As for the familial troubles, Alan is divorced and expected to come up with the money required to send his daughter to college. And as for the lump on his back, it’s a lipoma, a growth or cyst. But he believes it to be the source of his lethargy and loss of direction. However, from a storytelling perspective it serves as the physical representation of the troubles he seems to have accrued. That’s what makes a later scene in which he has a certain someone help him with the lipoma so significant. Rather than the sales pitch it’s the people Alan meets that make the biggest difference. He seems to always forget to set his alarm, so Yousef (Alexander Black) becomes his daily taxi driver, cultural guide and closest confidant. His team of IT tech salesmen rely on him to take care of their problems and set up their meetings. And Dr. Hakem (Sarita Choudhury) manages to take care of him physically and emotionally. There is plenty of opportunity for culture clash moments, but adding depth to the side characters or even fleshing out Alan’s relationship to them seems to have been left out of the film. Having not read Egger’s novel, I can only assume it includes more. Don’t get me wrong, Yousef and Dr. Hakem feel like fleshed out characters, and Alexander Black even steals a few scenes now and then. But Alan’s father, played by Tom Skerritt, is completely forgotten after just a scene or two. And Alan’s team of IT tech salesmen don’t get much screen time, nor do they end up factoring into the story much. There’s also a Dutch woman, played by Sidse Babett Knudsen, who pops up and just as quickly disappears. Yet despite so many side characters getting left behind, Hanks, Black, and Choudhury give such strong performances they end up being the only characters worth watching anyway. Tom Hanks excels at playing the everyman, and that’s exactly the part he’s playing here. He's done so in films like the ones he’s made with Steven Spielberg, The Terminal, Saving Private Ryan, and Bridge of Spies, in which Hanks gives us versions of himself. That is when he's most effective, and that's the sort of performance he gives here. Alexander Black, a relative unknown, gives a wonderfully natural performance. He plays the part with equal measures of care and humor. He’s a talent to keep an eye out for. Despite the shortcomings, Tykwer gave this film a clear artistic vision. The result is an entertaining film with some well rounded characters and interesting culture clash elements. It certainly doesn’t do anything groundbreaking. Its midlife crisis set abroad may feel all too familiar for some, but there’s a charm here that just doesn’t go away. Perhaps my affinity for fish out of water stories set abroad gave me a hint of bias, but I enjoyed this film. It does enough right to be worth seeing, and Hanks is an actor worth watching every time he graces the big screen.